After an overnight debate, the Wisconsin Assembly joined the state Senate and passed right-to-work legislation early on Friday. The bill, which would weaken labor’s collective bargaining power, now awaits Governor Scott Walker’s signature. Pushing through about 20 hours of debate, Wisconsin Assembly legislators voted to make their state the 25th in the nation to pass a right-to-work bill. The 62-35 vote was straight party-line, according to AP, with no Democrats supporting the proposal. The Assembly vote on right-to-work followed the Senate’s passage of the bill last week. Governor Walker, a prospective Republican nominee for the 2016 presidential election, will undoubtedly sign the legislation, as he has staked much of his term in Madison on sapping labor power in a once-prominent union state. Walker recently enraged opponents by likening protesters of his anti-labor agenda to Islamic State jihadists. The bill would make it a crime punishable by up to nine months in jail to demand private-sector workers not in a union to pay dues. Supporters said the proposal will make the state more attractive to businesses, while opponents said it was purely aimed at hampering collective bargaining leverage and depressing wages. Currently, Wisconsin unions can require dues of non-members, as the unions negotiate contracts for members and non-members alike. "Today is the day we have solidified the regressive era in Wisconsin," Democratic Rep. Terese Berceau said just before the vote. Walker had said during his re-election campaign last year that right-to-work was not a priority and would not come to a vote in the 2015 legislative session. Lawmakers, including Republican Assembly Speaker Robin Vos, also said the legislation would not come up for debate. But when the Republican-led Senate pressed forward with the bill, Walker and the State Assembly supported the effort. During Friday’s debate, Republican legislators repeatedly declared that the bill was about “freedom” over whether to pay union fees. "This is about freedom ... it's time for right-to-work in Wisconsin," said Republican Representative Dean Knudson, according to Reuters. Wisconsin employment is up, unemployment is down, and our labor force is growing, which means more freedom and prosperity. “I'm not going to apologize about using the word freedom," said Republican Rep. Jeremy Thiesfeldt, according to AP. "I'm going to use it over and over again because that's what this is about." Accused by Speaker Vos of having “Walker derangement syndrome,” Democrats said the bill is partly about the governor’s political aspirations as they chastised Republicans for once again targeting workers. "It's the workers in this state that are suffering through the politics of our governor's ambitions," said Democratic Rep. Cory Mason, according to AP. AFSCME member and Democratic Rep. LaTonya Johnson said the bill was symbolic of the legislature’s alienation from some of the state’s most vulnerable workers. "It just angers me to know that we come here and we pass bills that affect people's everyday lives and we don't have a clue as to how those everyday people live or how they survive," Johnson said. "This bill is a bunch of crap." Democratic lawmakers attempted to extend debate as long as possible, as many read testimonials and histories of labor’s achievements in the state. "I rise today to stand with labor, the mighty force that built this state," Democrat Rep. JoCasta Zamaripa said, Reuters reported. 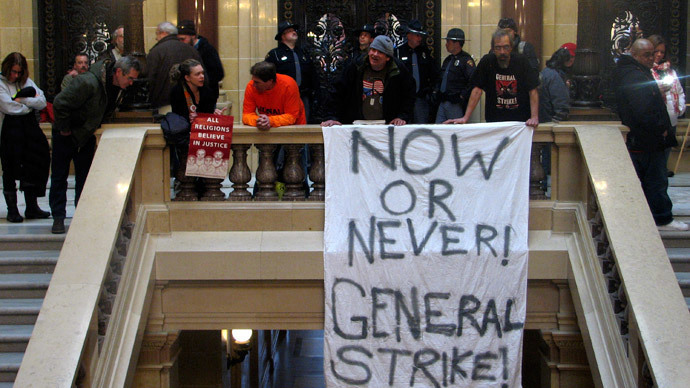 In 2011, labor supporters in Wisconsin turned out en masse to oppose Republican efforts to gut collective bargaining for most public workers, with as many as 100,000 people demonstrating outside the capitol in Madison. The legislation was ultimately passed and signed by Walker, who later survived a 2012 recall election that stemmed from that 2011 effort, which effectively ended collective bargaining for the state’s public-sector workforce. In 1959, Wisconsin became the first state to offer collective bargaining rights to public employees. But protests in recent weeks have not reached the level achieved in 2011. About 3,000 protesters demonstrated when the Senate debated the proposal, and only a few hundred were on hand Thursday and Friday to rally outside the capitol. Dozens of demonstrators were blocked by capitol security when they tried to reach the Assembly floor. Two people were arrested, Reuters reported. Shortly after the Assembly’s debate began on Thursday, protesters in the gallery interrupted Speaker Vos, chanting "Right-to-work is wrong for Wisconsin!" Vos subsequently ordered the chamber’s galleries to be cleared, leaving the debate to lawmakers only. Twenty-four other states have right-to-work laws, with Michigan and Indiana becoming the latest in 2012. Missouri could possibly become the 26th right-to-work state soon, as the state House passed a right-to-work plan in February, though not with enough votes to override a veto by Democratic Gov. Jay Nixon, an opponent of the bill.